Using contrasting materials and a simple form, Ronan and Erwan Bouroullec have created a statement sofa for Established & Sons called Cassette, offering versatility, comfort and modern style with a slim steel frame and soft upholstery. Established & Sons appreciate the design language of Ronan and Erwan Bouroullec, which is characterised by a combination of industrial design elements and traditional craftsmanship. This is how the British manufacturer and the two designers have worked together in the past. During Milan Design Week 2018, the Cassette Sofa was presented to the general public after four years of development. ‘Cassette' in French means as much as a small box or box in which you can store something precious, a kind of cocoon. This is also the message that Ronan & Erwan Bouroullec want to convey with their sofa: The result is a kind of alcove where you can relax without compromise. A straight-line frame made of powder-coated steel with warm oak elements serves as the frame for this feel-good piece. The clearly visible grain of the wood sets natural accents and skilfully creates a connection to the upholstery. Back and seat upholstery have a cover with wool and alpaca content, which provides a particularly fluffy surface structure. The upholstery reaches a value of 50,000 Martindale in the friction test for textile materials and is thus extremely hard-wearing. For comparison: Even a value of 35,000 Martindale is considered sufficient for use in public spaces. If the back cushions are removed, the Cassette Sofa, which can otherwise accommodate up to 3 people, can also be used as a sofa bed for guests and offers a good level of comfort. 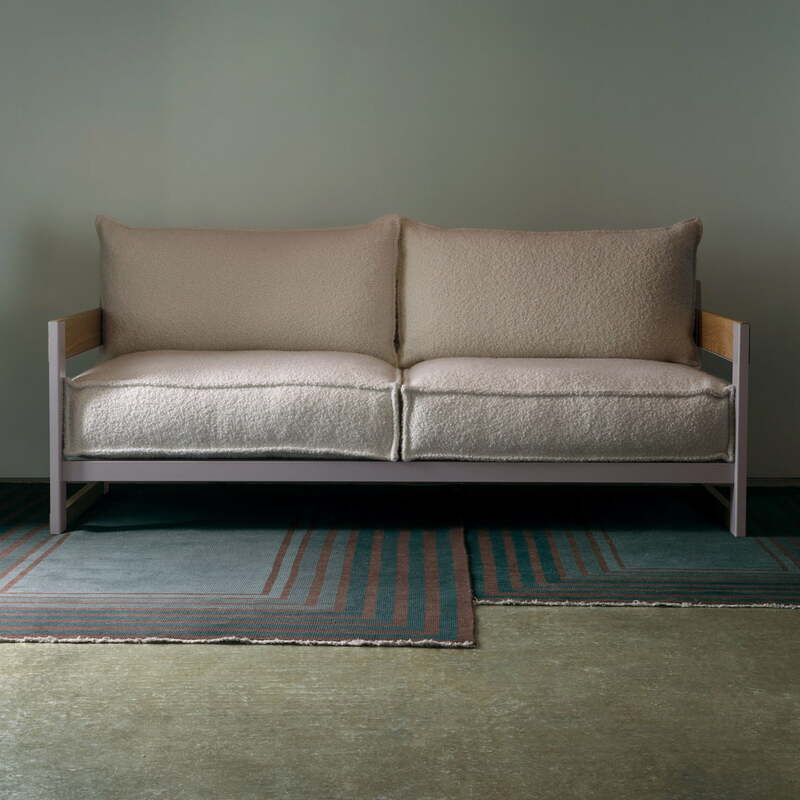 The Cassette Sofa by Ronan & Erwan Bouroullec for Established & Sons is characterised by a steel frame with wooden elements and a particularly fluffy upholstery cover. 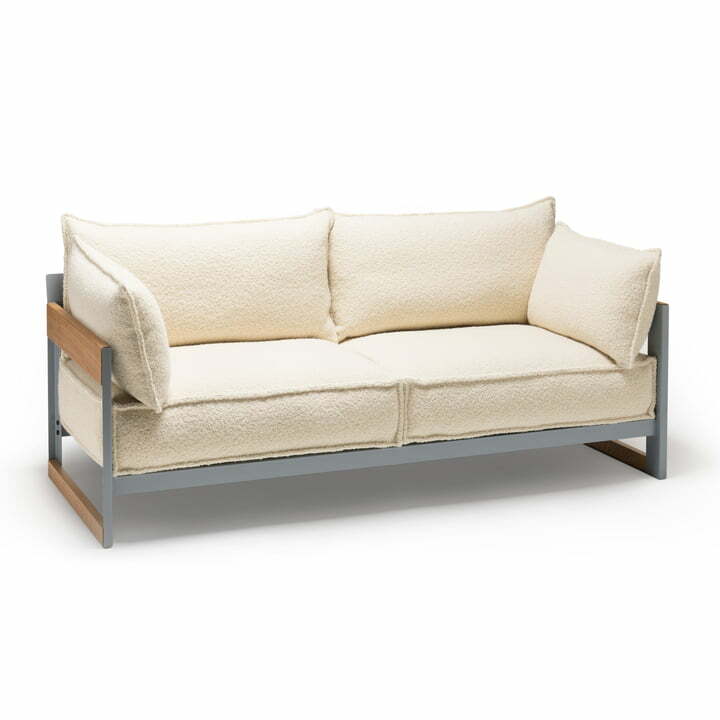 Lifestyle product image of the Established & Sons - Cassette Sofa, 3-seater. Using contrasting materials and a simple form, Ronan and Erwan Bouroullec have created a statement sofa for Established & Sons called Cassette, offering versatility, comfort and modern style with a slim steel frame and soft upholstery. 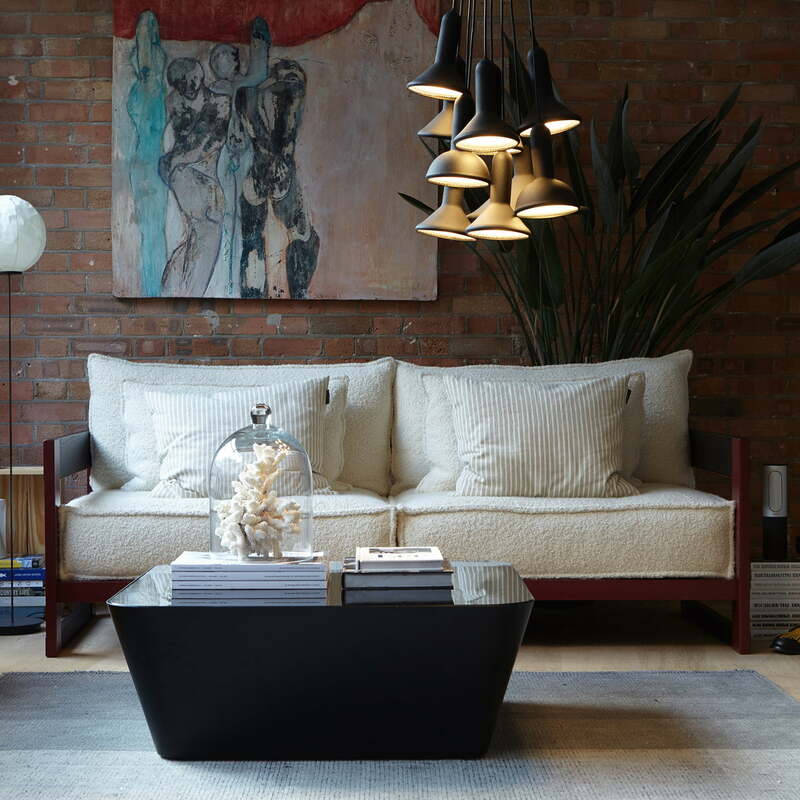 The Torch Light Pendant Lamp by Established & Sons can be arranged in a bunch of multiple lamps above the Zero-In coffee table and in front of the Cassette Sofa to capture all the attention in the living room.